Pentonville Road forms part of the inner ring road of London, running /east from Kings Cross to Angel Islington. One of the busiest roads in the city. This stretch is looking down to Kings Cross station. If you've just popped in to this blog, we are currently on a tour of the monopoly board starting from GO and taking in each square. I can't travel down here without remembering the King's Cross underground fire. 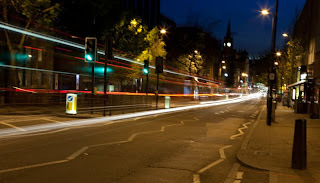 Love your photo with the traffic lights in streaks.